The AMAT Endura is a highly sophisticated cluster tool with 4 deposition chambers, 1 backsputter/rf etch chamber, and 2 loadlocks with cassette-to-cassette handling. Sputter deposition of Au, NiCr, TiW, Al, Ti, and Pt. Other targets can be installed, but with some limitations on material compatibility with the lab. DC magnetron sputtering in all targets.RF etch is for etching of native oxide on Si or metal. RF etch is not allowed on glass wafers and for lift-off processes. Glass wafers can be handled but without orientation. Because of this we cannot deposit Ti or Pt to glass wafers. The vacuum level in the deposition chambers is in the 2e-8torr range. 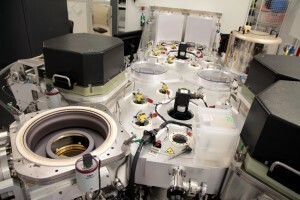 Two of the chambers (normally used for Ti and Pt) are configured for high temperature wafer control, up to 500degC. Sputter-down on 150mm wafers. For other sample sizes, a Si wafer or a dedicated holder made of Al can be used. This holder must fit into a cassette, but by modifying the cassette holders thicker than standard can be used.